It’s too bad that Norman Rockwell is dead, because maybe he’d be interested in painting these ideas. 1. A little girl pushing a baby carriage, and there’s a dog in the baby carriage wearing a baby bonnet and holding a rattle in its teeth: We think this one would have been a real crowd-pleaser. In our minds, the dog is a little terrier that’s white with black spots, and one of his crooked ears is peeking out from under the bonnet, but it could probably work with any breed of dog that can fit in the carriage. What an incredible painting this would be. 2. A man wearing virtual-reality goggles, and behind him the room is morphing into a fantasy landscape: Norman Rockwell died in 1978, so he never got a chance to depict virtual reality in his art. The way we’re imagining the painting, we’d see a man with a VR headset over his eyes, and his mouth would be wide open in an amazed expression. Behind him, we’d see the guy’s messy bedroom, which would be packed with mundane details like sports posters and dirty clothes on the floor, but there would also be fantasy-world stuff like ferns and trees sprouting from the carpet, and a dragon slinking around, and a castle far off in the background. At the bottom of the painting, Norman Rockwell could’ve written “VIRTUAL REALITY” in a nice yellow font. 3. Muscular arm wrestler letting a little boy win: Norman Rockwell may have already painted something like this. It’s hard to be sure, because he made so many paintings. But if Norman Rockwell didn’t paint a good-natured arm wrestler delighting a little boy by pretending to lose, this idea would be a good use of Rockwell’s talents. 4. A hobo thinking about a pie and another hobo reaching into the thought bubble to steal the pie: Norman Rockwell would have hit this whimsical Americana right out of the park. It goes without saying that the hobos would be in a boxcar and have bindles. We’ve seen this kind of fourth-wall breaking in cartoons before, but Rockwell’s realistic technique would have elevated it to another level. What could have been. 5. Zeus throwing lightning bolts into an electric car: Electric cars are big in the news now, and The Saturday Evening Post, if that still even exists, would probably want to run a cover about them. Just painting a car seems a bit boring, though, so we’d ask Norman Rockwell to jazz it up by having the Greek god of thunder perched on a cloud, hurling lightning into the car’s engine, and electricity would be crackling around the wheels. At the bottom of the painting, Rockwell could’ve written “ELECTRIC CAR” in a nice yellow font. We would be very firm about the yellow font, even if Rockwell objected. 6. 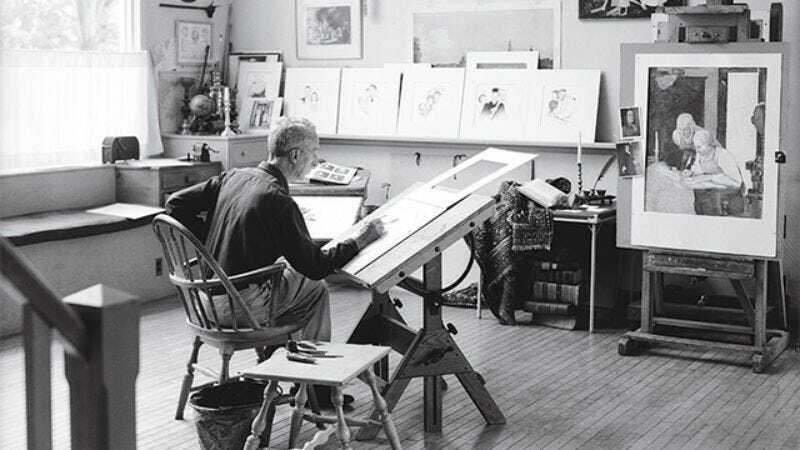 Sailors: Norman Rockwell excelled at painting sailors, and we’d love to see more of them, whatever he felt like drawing. They could be carousing in a bar during shore leave, hoisting crates onto a ship, tugging on ropes during a storm, or saluting their captain. If Rockwell ran with this idea, we know he’d come up with something special, but unfortunately, he’s dead. Oh well.